The ladies of OCC had some real competition on their hands on Friday, with a new ‘Weta’ trimaran scooping up first prize under the command of 11 year old Rebecca Gmuer-Hornell. 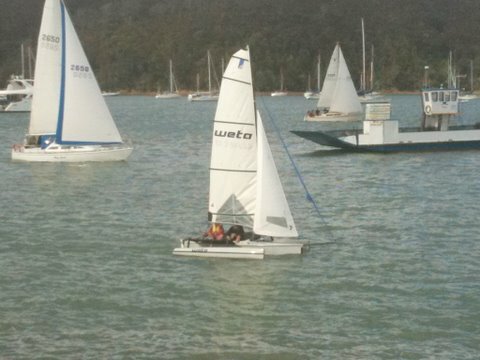 The Weta is a plastic trimaran that looks and performs like a high-performance race boat. But it is also stable, forgiving and easy to sail. Advanced sailors appreciate the trimaran’s performance and with the easy set up, people that don’t normally have the patience will find themselves grinning ear-to-ear on a 15 knot reach. Rebecca helmed the Weta, with Paul from the YNZ “Sailing… have a go!” program as crew. She did a very impressive rounding of the Marine Electric mark by pushing Hey Jude up and taking off. Great to see our young sailors out there. Kantime also boasts several young sailorettes – go girls – we girls can do anything! 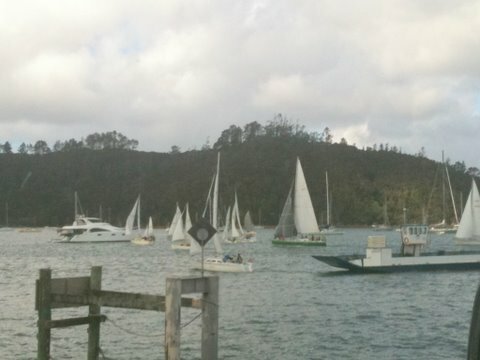 Lots of happy crew afterwards at the club soaking up the great “ladies race atmosphere” with an abundance of prices from our generous sponsors Makana Confections and Anne of Craicor.